"The most interesting story I ever heard was told me by a man more than eighty years of age. We were sitting together on a projecting rock of a mountainside in Arkansas. Here is the story:" - B.J. I was down in this country during the Civil War. Across on the other side yonder there were hundreds of tents where our soldiers were encamped. Measles broke out and many of the brave lads died. The epidemic got so bad we stretched some tents farther down the valley and moved all the measles patients into these tents. This, of course, was done to protect as far as possible the health of the well soldiers. 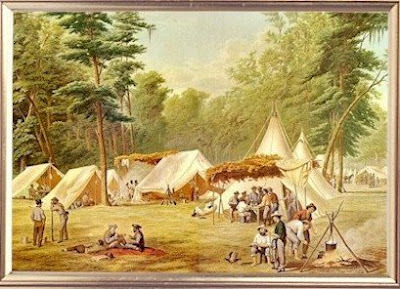 I was Wardmaster in charge of the tents where the measles patients were located. "Wardmaster, I believe I am going to die. I am not a Christian. My mother isn't a Christian. My father isn't a Christian. I never had any Christian training. I never did attend church. I did go with a friend to Sunday school just once. A woman taught the Sunday school class. She seemed to be such a good woman. She read us something out of the Bible about a man- I think his name was Nicodemus. Anyway it was about a man who went to see Jesus one night. Jesus told this man he must be born again. The teacher said all people must be born again in order to go to heaven when they die. I have never been born again, and I don't want to die like this. Won't you please get the chaplain so he can tell me how to be born again?" The old man hesitated for a little. "You know, in those days I was an agnostic- at least, that is what I called myself. As a matter of fact, I wasn't anything but an old sinner. So I told the boy, "You don't need a chaplain. Just be quiet now. Don't worry, you'll be all right." I went around the ward and in about an hour I came back to the boy's bed. He looked at me out of such sad staring eyes as he said, "Wardmaster, if you won't get me the chaplain, please get me the doctor. I am choking to death." "All right, my son, I'll get the doctor," I said. I found the doctor. He came and mopped out the throat of the lad so he could breathe a little easier. I knew the boy was going to die. I had seen many other cases just like his. The boy was so sweet he literally climbed into my heart. He thanked me for my kindness. He thanked the doctor for being so good to him. The doctor and I went away from his bed. In about an hour I came back expecting to find the boy dead but he was still struggling. As the light began to fade from his eyes he looked up and said, "There is no use, Wardmaster. I have got to die, and I haven't been born again. Whether you believe in it or not won't you find the chaplain and let him tell me how to be born again?" I looked at him for a moment and thought about how helpless he was in the grip of death. So I said, "All right, my son, I will get the chaplain." I walked away a few paces, turned and went back to the boy's bedside. I said, "My boy, I am not going to get you the chaplain. I am going to tell you what to do myself. Now, understand, I am an agnostic. I don't know whether there is any God. I don't know whether there is any heaven. I don't know whether there is any hell. I don't know anything. Yes, I do. I know one thing. I know my mother was a good woman. I know that if there is a God my mother knew Him. If there is a heaven I know she is there. So I will tell you what my mother told me. You can try it and see if it works. Now, I am going to teach you a verse of Scripture. The verse is John 3:16." My mother said that I cannot save myself, but if I will believe in Jesus, He will save me. I asked the boy to say the verse with me. I started and he followed with a weak and trembling voice, "For God so loved the world," "For God so loved the world," "He gave his only begotten Son," "He gave his only begotten Son," "that whosoever believeth in Him," "should not perish," "should not perish," "but have everlasting life," "but have everlasting life." "Now, my boy, my mother said if a person will trust Jesus he will not perish but have everlasting life." I referred the lad to another verse my mother taught me, but he closed his eyes, stretched his hands across his breast and in a whisper he quoted slowly, repeating some of the words several times: "For God so loved the world...He gave His only begotten Son...that whosoever, whosoever, whosoever believeth, believeth in Him, believeth in Him." Then he stopped and said in a clear voice, "Praise God, it works. I believe in Him! I shall not perish! I have everlasting life! I have been born again. Wardmaster, your mother was right. Why don't you try it? Do what your mother said. It works, Wardmaster. This thing works! Wardmaster, before I go I want to ask you to do something for me. Take a kiss to my mother and tell her what you told me, and tell her that her dying son said, 'It works.'" I leaned over and kissed him and then as he drew his last breath, he said, "It works." The old man, wiping tears out of his eyes and tears out of the wrinkles of his face, said, "The lad was right. It does work. Whosoever believeth in Him shall not perish, but has now everlasting life. It works. I know it works!" I am not ashamed of the gospel of Christ: for it is the power of God unto salvation to every one that believeth; to the Jew first, and also to the Greek. What an amazing story! Thank you so much for sharing these bible tracts with us every once and a while. It is a great idea! Thanks Joy! I like your stories. Did you get my e-mail? I sent it to mightbe@telus... We are expecting Christina in Nov. on her way to Texas, dv.